Laurent Tourondel opened his newest restaurant on Thursday, and he just began serving brunch on Sundays only, from 11:30 a.m. to 3:30 p.m. Try this fluffy omelette: It’s made with soufflé batter and egg whites, folded in half with cheese, cooked in a wood oven, and served with lemon-garlic olive oil. The Blue Ribbon team’s new uptown restaurant launched brunch at the end of August, and it offers rich, hearty dishes, like a prime-rib poutine with French fries, sautéed onions, cheddar gravy, and a fried egg; and ham-and-cheese toast with a poached egg and jalapeño-cheese gravy. Leave time for a post-meal nap. This East Village Mexican restaurant serves classic items, like chilaquiles, as well as more inventive dishes, such as this one with poached eggs, masa dumplings, black beans, and charred-tomato salsa. Amanda Cohen just launched brunch service last weekend, with playful options like this French toast with yellow-corn jelly and bourbon-corn butter, and tomato biscuits with basil butter and green-tomato jam. In Grub’s humble opinion, the ideal sit-down meal at Sadelle’s involves Melissa Weller’s bakery basket and the pigs in a blanket, but you’ll also have to wait forever for a table (even if you reserve ahead). You’re better off taking a bagel and a slice of the chocolate-chip loaf and walking to Washington Square for a DIY brunch. Chef Joseph Buenconsejo is the latest to hop on the veggie-burger bandwagon: His patty is made with grains (farro, buckwheat, quinoa, bulgur), dehydrated and smoked mushrooms, and miso. It’s topped with a mustard-yuzu aïoli, smoked paprika-pickled onions, provolone cheese, smoked cheddar, smoked caramelized onions, fresh tomatoes, fresh red onions, and upland cress on a housemade herb brioche. This new-ish French restaurant in Bed-Stuy from the owner of Le Philosophe serves a classic French dish of red-wine-poached eggs in Burgundy sauce. The green-tea-smoked wild Atlantic salmon with dill salt sounds intriguing, too. Michael Psilakis has expanded his Greek-restaurant empire to Williamsburg, and he’s serving a warm, fall-appropriate dish that includes merguez, potatoes, onions, and feta cheese. For the first time since it opened in Soho last October, Maman is starting brunch service on September 26. It’ll be open on Saturdays and Sundays from 9 a.m. to 3 p.m., with a French-inspired menu that includes a signature croque “Maman,” French toast with poached pears, and these pancakes with blueberries and shredded coconut. This family-run Clinton Hill restaurant has a NorCal vibe, which extends to this hyperseasonal, vegetable-forward dish, which also includes smoked trout and a fried egg. 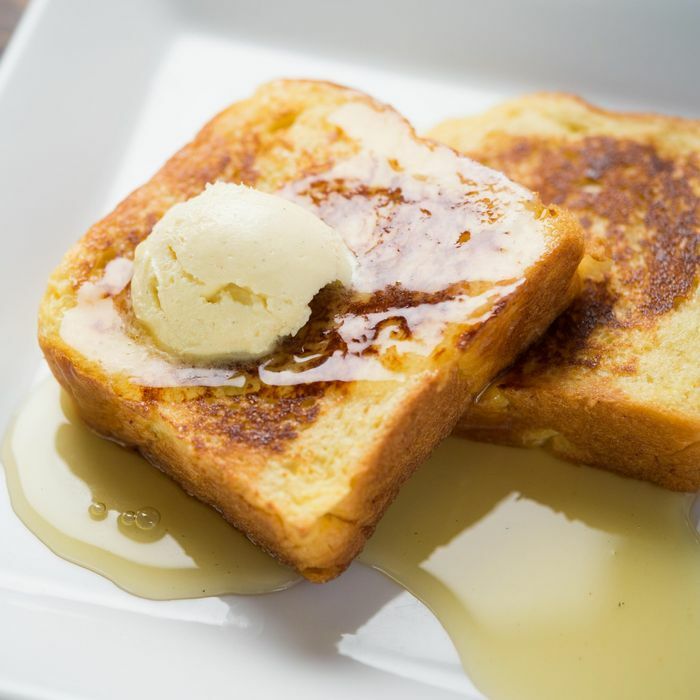 ICYMI: Marcus Samuelsson began serving brunch in Harlem over the summer, and his French toast is quite special: Homemade cornbread gets battered, griddled, and topped with a seasonal-fruit compote, maple syrup, and powdered sugar. As Grub has previously noted, this platter is a triumph — and it’s more like a raw bar in brunch form. 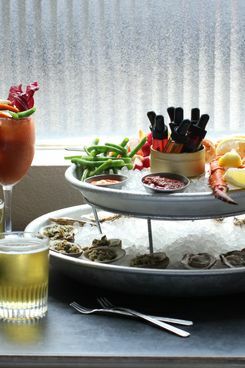 It includes two actual Bloody Mary beverages, and sidekicks of pilsner and pickled vegetables, along with raw oysters, clams, shrimp cocktail, and crab legs. You can trust that John McDonald will serve an excellent breakfast sandwich, and this one includes scrambled eggs, mozzarella, and prosciutto. 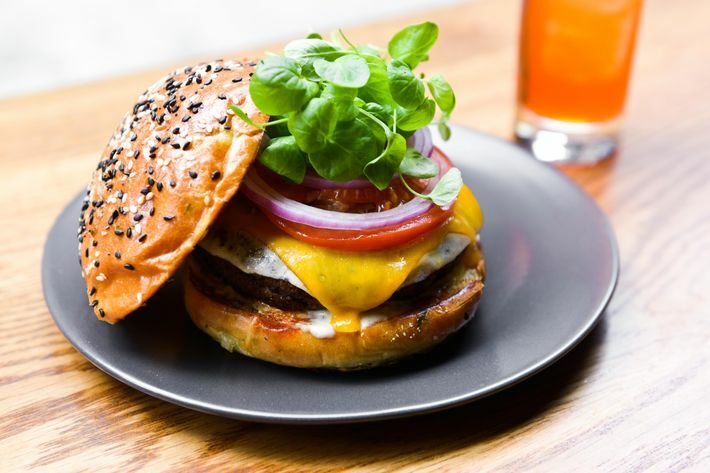 This small Soho burger joint will launch brunch on September 25, with a spicy chorizo burger topped with jack cheese, pico de gallo, chipotle mayo, and an optional egg. Over at the Pines’ sister restaurant in Bed-Stuy, John Poiarkoff is serving brunch dishes that are actually interesting and ambitious: This pancake comes with yogurt, peaches, and pecans; and there’s also a savory bread pudding made with oxtail. Chef Jason Atherton is British, so it’s a must to order this spread of two eggs (any style), toast, garlic-and-herb pork sausage, bacon, tomato, portobello mushroom, and, of course, black pudding.